Please do not 'take' this graphic, it was custom made for my Sleepsacks. Thank You. See bottom of page for info on this Animation. Click pics to see a larger view. I need to raise my prices...I am so sorry! Sleepsack sizes are approx. 15 inches by 17 inches. for added strength and durability. as usual...the pics do not do them justice. The cost is $20.00 each. 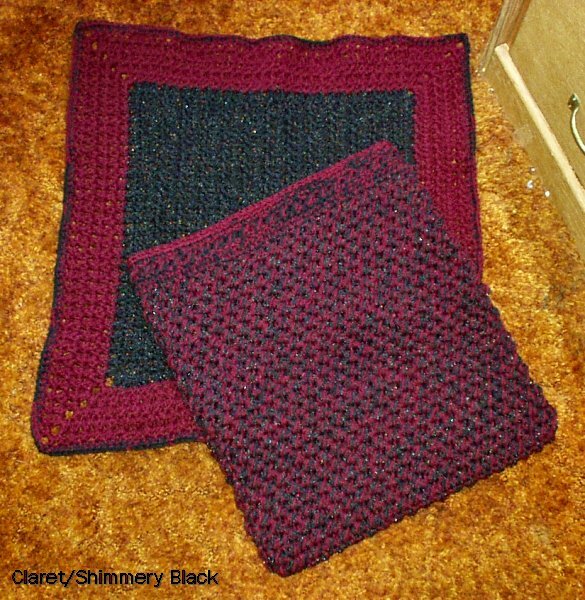 Blanket sizes are approx. 24" by 24"
so I can find out what colors you want and if there are any special instructions. Click here for the $35.00 Set, plus $7.00 shipping. Click here for the $20.00 Sleepsack, plus $6.00 shipping. 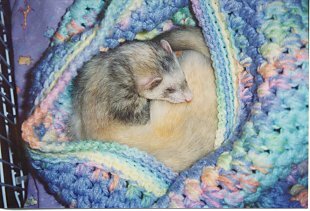 Click here for the $20.00 Ferret Blanket, plus $6.00 shipping. Click here if you are buying multiple items where the shipping is combined. e-mail me for a total to put in here. Or you can Snail mail me a check or money order. Please ask me for my mailing address when you e-mail me about what you want. Paddington Bear Heyn: "The sleepsack is very cuddly and warm and snuggly! Makes .... me ..... sleepy .... zzzzzzzzz ......"
Lil Bear Heyn: "I asked Mommy to get me a sleepsack for Christmas. But since I share da house wit two VERY STOOOPIT BRUDDERS, I was worried about having to share my sleepysack, too. Auntie Kat has GREAT customer service! Mommy explained dis problem to her, and Auntie Kat shipped da sleepy sack wit a sign I could put on it. Da sign says, 'Stay out of my sleepsack, Theo, because you are VERY STOOPIT! And you, too, Paddington Bear!' It doesn't always work, but I like having da sign. Da customer service was very, very, very, very, very, very, very, very good." Theodore Bear Heyn: "I was a bit perturbed to find one of our two holiday sleepsacks had a sign attached characterizing me as 'STOOPIT'. However, I was soon able to overlook that minor indiscretion, due to the otherwise excellent nature of these sleepsacks. The quality of the yarn and fine handwork are truly outstanding; these sleepsacks are of the highest quality! 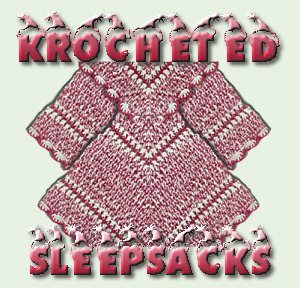 Because the yarn is so dense and high quality, the sleepsacks are very warm, while the crocheted nature of the material allows fresh air to comfortably pass in and out. These sleepsacks are quite large and could comfortably accomodate two or three or even more NORMAL ferrets (who do not exhibit the immaturity which causes certain animals in my household to not wish to share sleeping accomodations). They come in a variety of colours and styles to match any decor. I highly recommend them." THANK YOU THANK YOU THANK YOU! Impy loves her sleepy sack! Even more astounding, the cats and my husband love it also! When my hubs saw it he said "That's for Impy? That is way too nice for her you should save it so it doesn't get ruined". Pretty funny! Anyhow, I informed him that it was made especially for her and that she is going to snuggle in it. She loves it and I am so happy to have such a thoughtful and lovely sack for her. You do great work! Thank you again so much and again good luck!!!!!!!!!! Thank you for reading about her and for your kind words and thoughts. I would sing "you are my sunshine" to ee after each of my original 5 past away...cause she made my heart heal by dancing around me...please in honor of her spirit, silly as it sounds, sing this to your babies 2nite for me? Graphic Animation created by "Jassmine". THANK YOU SO MUCH, JASSMINE!!!! Click Graphic to contact her.